AFTER having bagged five time’s place in Limca Book of Records and winner of National and International awards, Suraj Muchhala, Managing Director (MD) of Arun Muchhala group received the Accommodation Times -29th National Real Estate Award for Excellence in Real Estate for the year-2014. 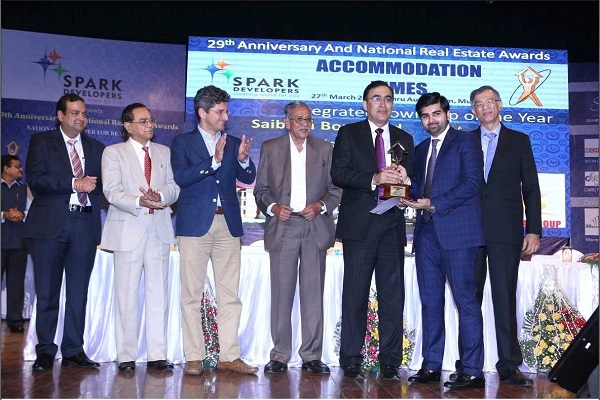 On March 27, 2015 the Accommodation Times hosted the prestigious 29th National Real Estate award for excellence in Real Estate for the year 2014. The award for the best integrated township (Boisar) was awarded to Suraj Muchhala. He received this award by the hands of Niranjan Hiranandani (Hiranandani Group), Rajiv Sabharwal (ICICI bank) and Boman Irani (Rustomjee Group) in a function at Nehru auditorium, Worli. Several other dignitaries from the Real Estate fraternity were present for the event. The integrated township, Sai Baba Boulevard is an Eco friendly initiative located in Boisar, Maharashtra. Muhammed Afnas Aboobacker Panatharayil, (Director ITL world), Sukesh Shetty, (Bank Manager), T K Dwivedi “Akela’ (Editor –ABI), Viral Savala (Builder), Jinesh Patel (Businessman) Rushabh Agrawal (Businessman) and Rishi Joshi (Businessman) like hundreds friends have congratulated very young and hardworking Suraj Muchhala for this achievement. Arun Muchhala (father of Suraj Group), established in 197I is one of India’s largest and most respected conglomerates in the field of development and construction in residential and commercial building, in villas, condominiums and business parks and hotels. The Group has constructed the very famous Suraj Water Park, Fun World Tourism and Sai Shiv Educational Trust. Arun Muchhala is a well-known businessman having diversified activities with illustrious record of Real Estate, Education, Entertainment, Hospitality and l.T. “Delivering quality construction services at unequalled performances is the motto of Arun Muchhala Group,” said Ankit Hirani.